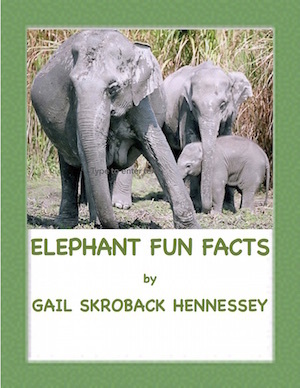 Learn lots of fun facts about Elephants(and activities to do, too!) Amazing Elephant Facts! Did you know that elephants can be right or left tusked, kind of like humans are with their hands? Did you know that the elephant has the largest brain of the animal world? And if you think elephants like peanuts...they really do not! 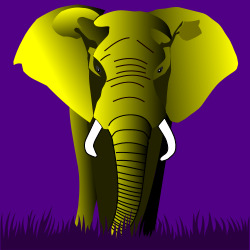 Learn more interesting facts about the elephant with this fun and informative webquest. 1. Elephants are the world's largest living land mammal. Elephants eat grasses, bark, leaves and other types of vegetation. What are the two types of elephants?__________ and _________ Find the answer at this link:http://www.sciencekids.co.nz/sciencefacts/animals/elephant.htmlNote: a third species is sometimes included-the African bush elephant. 2. Elephants can eat 300-600 pounds of food a day and live in families. What are three differences between the two species of elephants? NOTE:This webquest has 11 questions and several extension activities as well as some interesting additional trivia about the elephant. 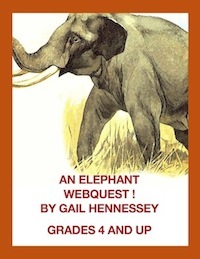 Check out my Elephant Webquest at my TpT Store:Elephants: On Safari(a Webquest)!